Besides being wonderful, insight is also scarce – so scarce in fact that, in all these seven years no one has truly been able to cut the Gordian knot that is the ‘abduction’ of Madeleine McCann, never mind cut it completely in two. Or three for that matter. For that we must defer to Himself. What he presents here is not ‘opinion’, coloured so as to conform to a context of allegiance, nor interpretation influenced by surmise. Here we have evidence, pure and simple - evidence conveniently shunted into a siding by all those who cannot bear to confront the truth, and largely undervalued by others unduly concerned with the incessant regurgitation of garnish so often first coughed up by ‘a source close to something or other’. How likely is it that two people can be independently mistaken about an open or shut situation? How likely is it that these same two people should independently, yet simultaneously, decide to ‘prune’ their respective cell ‘phone memories? How likely is it also that two different dogs, on two separate occasions, could show interest in different, yet mutually corroborating, scents, and at the very same loci? That the Establishment now includes the Prime Minister David Cameron, who as a result of pressure by Rebecca Brooks, pressure being a polite word for coercion, as coercion is for blackmail one must say, is for the intents of this post, quite academic. As for the involvement of the Home Secretary, Theresa May, that involvement becomes a good deal less academic, given the Home Secretary's overall responsibility for the policing of the Nation. Granted that some of that responsibility is now diminished since the introduction of police and crime commissioners, a system laid bare to justifiable charges of nepotism, I easily add. But that is by the by and concerns us little, for there was no such office at the time of initiating a "review" of the Madeleine McCann case by DCI Andy Redwood and Scotland Yard's finest. Something, I think I can maintain, that is unique in the history of English policing. But that uniqueness is far from alone, as we shall see. Is it not unique, that in the case of a missing child, presumed dead by the investigating police force and for good reason, that when the very cornerstone of the McCann's claim for a case of stranger abduction, turns out to be a tissue of lies, but is then seemingly ignored by those charged with this nonsensical review? Before we had even heard the name Madeleine McCann, the script had been written, distributed, and was being learned by rote, albeit to an embarrassing degree, by seemingly every member of the McCann's extended family. The source of which, and undeniable, Kate and Gerry McCann. As simple as that may sound, it is in fact, of such profundity that it cannot, and should not, be ignored. The cornerstone for abduction, and all that surrounds it, is a house of cards. A house that took a shift years ago. The only thing propping it up now, is the litigious nature of the McCanns, to say nothing of a totally corrupt establishment. Now call me old fashioned if you will, but this bothers me. But it bothers me more, that this fundamental and crucial component of this case, not only remains unaddressed, but seemingly, is totally ignored. To finish up this part of the post, there being two other fundamental issues I wish to address, let me try and apply some perspective to this staggering and blatantly obvious miscarriage of justice. If our featured two were suspected of robbing a Post Office, and it's not by accident that I use a PO as an example, because, you may be surprised to know, there is no greater crime in the UK than making an unauthorised withdrawal from said establishment. So if our two suspects, under questioning, uttered the kind of testament or set in motion testament such as we have witnessed, what might you suppose, the outcome would be? Are they such an important issue you may ask? Well they were important enough for the McCanns to lie about them, so they must be. They claim Gerry was sent 10 texts from an unknown number 24 hours before Madeleine disappeared. And detectives say four messages arrived from the same mystery number the day after she went missing, according to court documents. "Any suggestion of Gerry receiving 10 texts the day before Madeleine disappeared are utter rubbish. "He hardly used his phone during the holiday and most of the friends with them didn't even have mobiles. I haven't bothered with the second sheet that shows the final two calls. More on the deleted phone records from Paulo Reis, a worthy read. 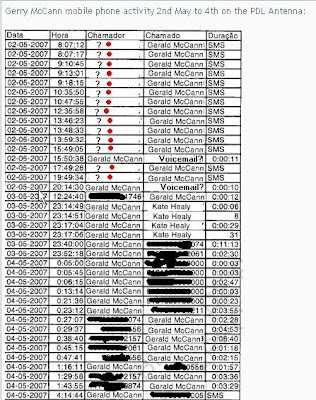 Would Gerry McCann have the wherewithal to implement and carry out such hair-brained scheme as the one we have witnessed without the gears being set in motion by third parties of no little importance and influence? All issues mentioned here are searchable and verifiable. To quote Pat Brown: "The McCanns asked for this review; they put their trust in the outcome." fiasco.I hope Blair,Brown etc are satisfied. cadeaver dogs react to the trunk of Casey Anthony's car and yet they find her "not guilty"
"Firstly, two irrefutable facts. No one had previously died in the McCann's holiday apartment, likewise nobody had previously met their end in the car hired by the McCanns." DNA in Casey's car proved it was the DNA of a DEAD FEMALE ANTHONY! no other FEMALE ANTHONY IN THE IMMEDIATE FAMILY was missing and or DEAD except for CAYLEE ANTHONY! No one drove the car but CASEY, proven - yet NOT GUILTY! And here the McCanns are getting away with the same thing! Unbelievable! One of the jurors interviewed after the verdict admitted they KNEW casey had murdered her daughter but then claimed the prosecution hadn't proved its case! The jurors aquitted based only on the fact they were looking to make mega money from the books and interviews after the verdict. sadly for them and rightly for us, the book and interview offers did not come flooding in/. Casey is still living with some personal PI and mooching off her lawyers. No one will interview her, several made initial inquiries but withdrew speedily once the public found out and books offers were not forthcoming. She was and still is a social pariah, hated by the world and unemployable.